Slate and terracotta are durable and forgiving materials. Appropriate sealers mitigate the absorbency of fired clay. Aggressive cleaning can remove accumulated soil, but professional striping is necessary to remove old coatings and wax. The best results can be obtained by using the right materials before soil accumulates. The best cleaner is stone soap cleaner formulated for cleaning natural stone. Stone cleaners are available from tikkoproducts. They are highly concentrated, and are actually economical to use. A stronger solution of stone cleaners can loosen small areas of stubborn dirt. Apply with a sponge and agitate the soil with a soft natural brush but do not allow the cleaner to deeply penetrate the terracotta. Wipe up thoroughly and rinse well. Stain removal is not guaranteed. First determine whether the stain is water based (wine, etc.) or oil based (salad dressing). tikkoproducts sell poultices that can usually absorb the stain, until it is virtually undetectable. Follow the directions exactly. Usually the poultice is slightly moistened with a suitable liquid, and then spread over the stain. The poultice is usually covered with plastic wrap so that it remains moist. After the specified time has past, remove the plastic cover and wipe up the poultice. Clean with stone cleaner. 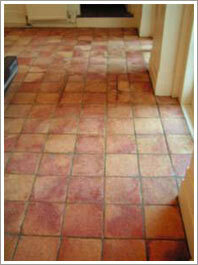 If two applications of the poultice do not lighten the stain, it has penetrated the terracotta too deeply. Consult with a professional; professional cleaners may lighten some stains; however, oily stains in brick and terracotta are often permanent.